UNITED NATIONS, August 5 – Following up on Inner City Press exclusive publication of UN Development Program audits of its Law and Order Trust Fund Afghanistan, including double payments and other irregularities, whistleblowers have exclusively provided Inner City Press with more damning documents. For now Inner City Press is exclusively publishing this one, linking it to the LOTFA scandal: an official "was again advised that it may be illegal for salaried police officials to take cash payments to augment their salaries" but the adviser was told it was "no longer my priority under LOTFA and that I was no longer to address these issues with DPII or DSS." 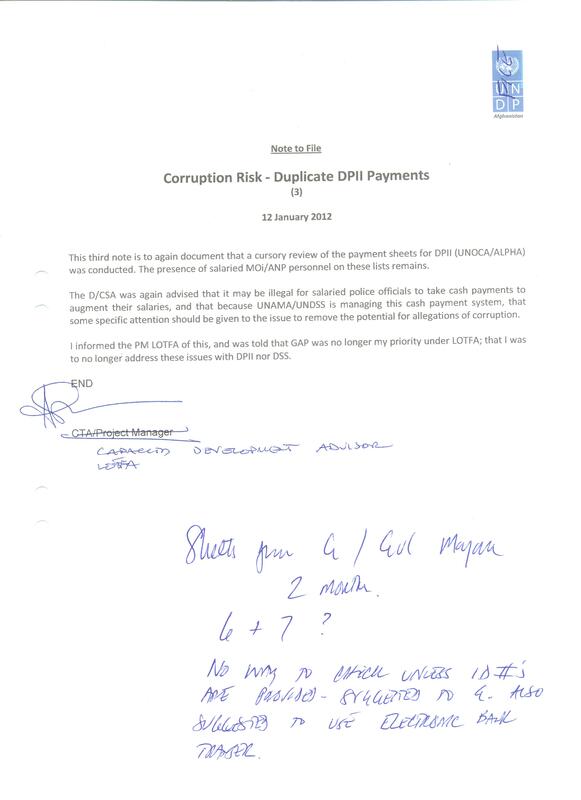 This and the other documents indicate that little was fixed, that UNDP goes after whistleblowers, and does not follow up even when for example it is involved in visa fraud. UNDP purchased $100,000 in fuel for a special police unit and it was discovered that some or all of the fuel was stolen by the police. The project manager - chief technical adviser for the project refused to purchase another allocation of fuel due to this reported corruption. Refusing to purchase this additional fuel caused problems between the project manager - chief technical adviser and the chief of UN security in Afghanistan. This followed with reports that several vehicles purchased by this same UNDP project and given to this same special police unit were not being used for the unit but had instead been given as political gifts or other reasons to other offices of the Afghan government. After giving these vehicles to higher ranking officials the Colonel of this special police unit was promoted to General. The project manager - chief technical adviser reported this and nothing happened. As part of the review which discovered this the corruption of payments made by the UN security office in Afghanistan to the special police unit was also discovered and reported. UNDP's staff from Afghanistan have not returned to their duty station after being granted visas to attend/participate in the recent UN Games in the USA. UNDP supported the official/G4 visas for all of these Afghan nationals and now they have remained behind in the USA... How can the organization justify sending a dozen people half-way around the world to compete in 'UN Games'? How many of them were given business class tickets since the travel exceeds the 9 hour standard? Is this a proper use of public monies? How can an office so critical to the development of Afghanistan in this time of change see it as beneficial for a dozen of their staff to go on a paid junket to the USA? This is on deadline. This is also a request for UNDP's response to the staff survey and the critique(s) of the restructuring / layoffs. More than four hours and one UNDP press conference latter, no answers from UNDP. When they arrive, we plan to have more. Watch this site.